The Niland Company was formed in 1972 as a Texas Corporation by Thomas M. Niland. He is a graduate of the University of Texas at El Paso and the University of Texas School of Law at Austin. The firm began by brokering and importing architectural products from Mexico and Italy, primarily to municipal and commercial construction projects. This evolved into an outdoor street light and site furnishing business, which has supplied architectural products of nostalgic nature to cities and commercial projects throughout the United States, France and Japan. The specialties required for the production of light standards and site furnishings include the processing of raw aluminum, steel, cast iron, production of plastic globes and lenses, H.I.D. wiring and electrostatic painting and powder coat painting. All light standards are listed with Underwriters Laboratories and are subjected to periodic inspections by that company. Niland Company now sells over 1,000 separate and distinct street lighting and site furnishing products, easily customizable to over 100,000 distinct combinations. 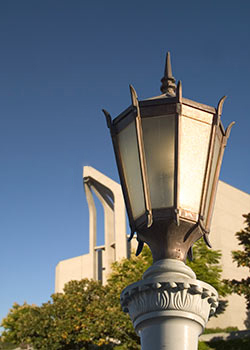 We specialize in converting historical designs from the past into performance driven, "dark sky" compliant luminaires. In 1985 the need to manufacture O.E.M. plastic globes and lenses for the street light business became obvious. This led the Company into rotational molding. Niland Company's plastic product line has now evolved into custom work for major automotive, heavy truck and bus manufacturers. The Company also manufactures its own line of polycarbonate refractor globes and UV-stabilized decorative planters as well as custom molding of patented equestrian training products and items for Government Services Administration under its Roto-Vac Plastics Division. Mr. Niland is the past President of the International Association of Rotational Molders (ARM), a world wide Association of more than 500 companies from 44 different countries. Jack Niland began working for The Niland Company as Vice President of Sales in 1995. His main responsibility is in the management of the companies more than 82 independent sales representative agencies around the world. These agencies account for 70 percent of the companies total outdoor lighting sales. Customers include Municipalities, Utilities, Electrical Distributors, Contractors, and Developers. Matthew Niland began working for The Niland Company in 1998 as Vice President of the companies custom Powder Coating and Finishing Division. The regional market for powder coating is derived mainly from National Metal Stampers servicing Fortune 500, Consumer Electrical product companies across the border in Mexico. The Niland Company is centrally located in El Paso, Texas. Our 90,000 square foot facility is one mile off Interstate 10. Our shipping department can move your order anywhere in the world quickly and economically. Whether you need custom rotationally molded plastics, powder coat paint services, assemblies and drop shipping, our trained staff can assist your project development team from concept to creation and completion. We personally invite you to tour our facility at any time. Please feel free to visit our website at www.nilandco.com, where you can download AUTO CAD files, and PDF files, for any of our extensive product line. We look forward to the opportunity of working with you and hope to gain your confidence as a trusted supplier of Fine Outdoor Lighting Products.